Decks are one of the best places to relax and entertain. But decks can require a lot of maintenance because they are exposed to all of the elements of the outdoors, as well as a lot of foot traffic, and more. Properly staining decks for 24 years, Anthony Meggs Painting LLC will help maintain your decks beauty for many years to come. Whether you’re looking for deck staining, deck cleaning, deck restoration, fence staining or another surface stained, our expert stainers will leave your wood looking new again. Call (704) 659-1313 today for a free quote! Here at Anthony Meggs Painting LLC, we know the necessary preparation for a quality sealed deck. In many cases, more is better. But when it comes to staining wood, Anthony Meggs Painting LLC knows just the right amount to ensure long lasting results and value to your home. 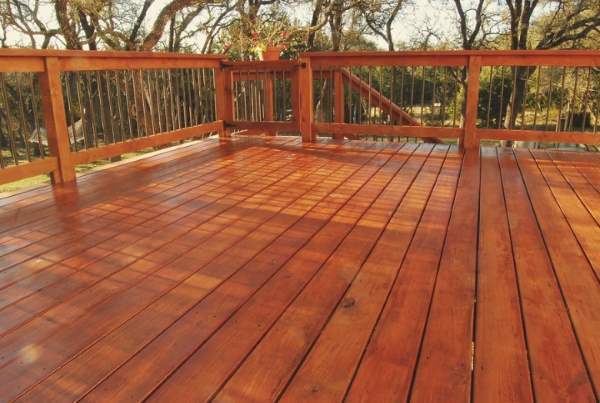 Adding too much stain can cause your deck to peel or crack when it’s exposed to the moisture of the outdoors, and will also leave the wood sticky and not dry properly. We use natural bristle brushes to effectively work the stain right into the wood fibers. First, we will heavily coat the entire wood surface, then brush a few boards at a time from one end to the other to ensure the strokes are smooth and to avoid any lap marks. And more! Just call (704) 659-1313 for a free quote. Leaving your deck untreated or without being maintained can cause it to look discolored, splintered, or even more severe, cause the wood to rot or decay. Using quality deck cleaning and sealing products for 24 years, Anthony Meggs Painting LLC will ensure that we are providing your deck with expert care and maintenance that will keep your wood and the value of your home protected. Call (704) 659-1313 today to get your deck restored and looking beautiful!